How Far is Fenbreeze Apartments? 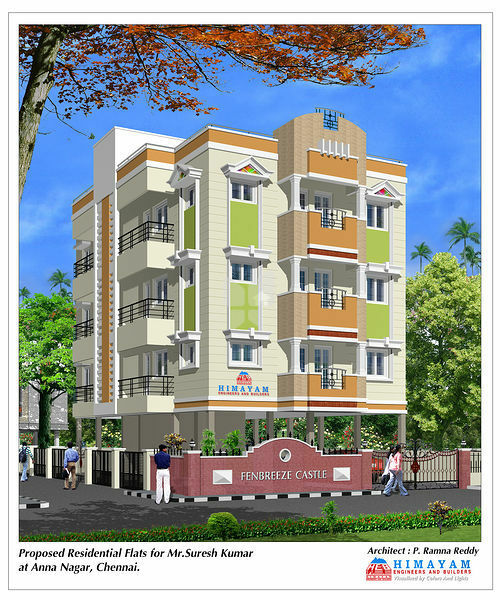 "Fenbreeze Apartments has premium range of apartments with a well planned structure. Adheres to high standard of urban living and designed to effectively use the available area. Each apartment is carefully designed to ensure you get the best of everything, beautiful interiors, ample ventilation, top class amenities, high quality fittings and sophisticated accessories." Reinforced cement concrete framed structure with isolated column footings connected with tie beams with earthquake resistance design and using TATA steel or I steel and first grade cements like L&T, Coromandel or Birla. Good quality brick walls of 9” thick on outer walls and 4½” thick partition walls and plastered with good finish. All doors and window are of good quality teak wood and windows will have solid square MS grills. Maindoor solid teakwood panelled door shutter with teakwood polish. Interior woodwork of covering wardrobes and lofts in both the bedrooms and modular kitchen work in the kitchen. Three phase power connection with phase changer 20Ams power plugs for all A/c supply in all rooms and Living Hall. 15 Ams for geyser in Toilets and enough power points in kitchen, rooms and hall for all purposes. Concealed cables for TV connections and 3 pair telephone lines in Living and Master bedroom. Modular switches of premium quality Legrand switches and ISI brand wires will be used with standard circuit breakers and load distribution. Living, Dining Marble or granite flooring Rs.125/- per Sq.ft. and other areas Marbonite or fully vitrified tiles flooring of standard brands like Johnson, Somany, Asian or Nitco Rs.70/- per Sq.ft. and toilets concept series good quality glazed tiles upto 7’ height or upto ceiling height. Jaquar CP fittings, Parryware or Hindware sanitary fittings with concealed water tanks. Stainless steel or granite moulded sink with granite counter top. Internal walls two coats of Birla wall putty, one coat of primer and two coats of premium interior emulsion. MS grills and Balcony grills are painted with enamel paint. External paint premium quality weather proof Apex paint. Carpark area and pathways all round the building will be provided non-skid concrete designed tiles of Nitco or branded company concrete tiles. OTIS or Johnson or Emperor with lift front walls in the lobby will be provided with granite stones or designed decorative tiles for easy maintenance and for good looking. Power backup generator. Lobbies flooring will be provided with marble or granite flooring and staircase steps are marble or granite steps with non-skid grooves. One deep borewell for ground water and 16,000 litres capacity RCC underground sump for Corporation water. Two RCC overhead tanks. We will do proper rain water harvesting pit near borewell or well filled with gravel and brick bat and covered with concrete slabs with air vent. Open terrace we will do water proofing with grano flooring and above that brick bat and lime with Jagari and kadukka for heat resistant above that good quality Kerala pressed tiles. Possible extent roof garden and few sitting benches and rust proof cloth lines for drying. Proper lighting arrangements for any small evening functions or get together. We will take much care to provide good looking elevation by providing costly castings and allround band work by specialized skilled labour and weather proof paintings. Entrance gates also heavy good looking castings gates with supporting pillars will be provided with granite for good looking and easy maintenance. 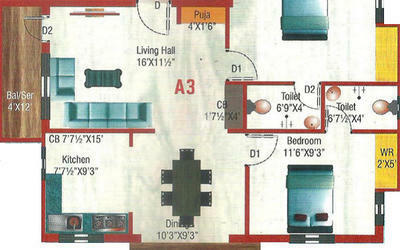 Security room with sloping roof with red tiles and intercom facility for all flats. Common toilets for security, servants and drivers. All round the building good plantation with possible extent green gross lawn.